A series of videos has been going around showing Zakk Wylde, former guitarist for Ozzy Osbourne, playing classic rock and metal songs on diminutive Hello Kitty guitars. They're funny: seeing the burly, bearded legend rock out on a kid's guitar; but they're also pretty impressive, when he wrings real grit and feeling from these unlikely instruments. I imagine it won’t be long before we’ll see a similar stunt with someone like Moby, for example, ripping out danceable grooves on the Blipblox, a kids' toy that is also a fully-functioning synthesizer (“actually, it’s both”!). While the Blipblox may look like one of thousands of noisy console-like toddler toys, it’s one that won't tempt parents to do what many parents do (be honest)—pull out the batteries and hide them where they can't ever be found. If those specs sound like an alien language to you, they won’t make any more sense to your 3-year-old, and they don’t need to. 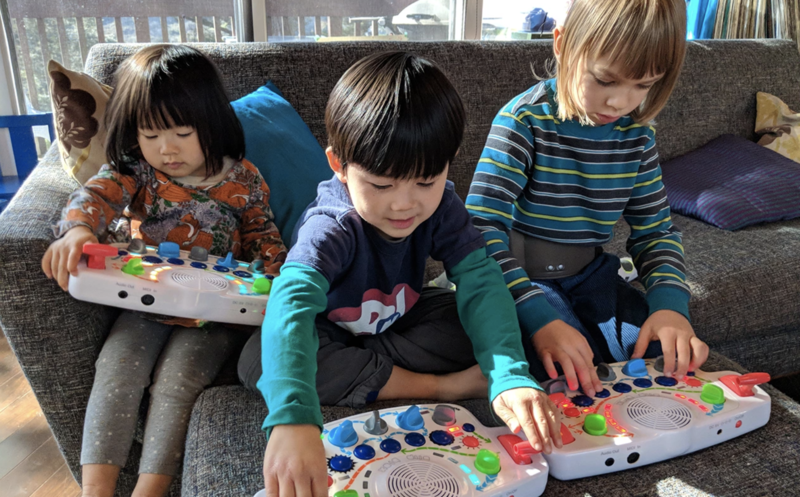 “The blipblox was made to have fun without fully understanding how it works,” says the toy synthesizer’s creator in an introductory video above. Turn it on and start hitting buttons, twisting dials, and pushing the two joystick-like controllers back and forth, and beats, bleeps, bloops, blurps, and other synth-y sounds spill out, at various tempos and pitches. As kids (or parents who hijack the device) gain more control, they can start refining their technique and create original compositions, as you can see happening in the “studio sessions” video above. Then they can output their sounds to mom and dad’s home studio, or wherever—Blipblox is ready, as its Indiegogo campaign promises, for “a pro studio setup.” Or just lots of entertaining goofing around. Thanks so much for the great article, Josh! We are announcing our Indiegogo Launch date next week.